Since then, there has been little indication of Iranian work on a missile that could reach significantly beyond the Middle East, and Iranian leaders have said they do not intend to build one. So, this spring, when a team of California-based weapons researchers reviewed new Iranian state TV programs glorifying the military scientist, they expected a history lesson with, at most, new details on a long-dormant program. Instead, they stumbled on a series of clues that led them to a startling conclusion: Shortly before his death, the scientist, Gen. Hassan Tehrani Moghaddam, oversaw the development of a secret, second facility in the remote Iranian desert that, they say, is operating to this day. For weeks, the researchers picked through satellite photos of the facility. They found, they say, that work on the site now appears to focus on advanced rocket engines and rocket fuel, and is often conducted under cover of night. It is possible that the facility is developing only medium-range missiles, which Iran already possesses, or perhaps an unusually sophisticated space program. US Secretary of State Mike Pompeo on Monday warned Tehran would be hit with the “strongest sanctions in history” and cautioned European firms against continuing to do business with it, toughening up Washington’s policy line after its withdrawal from the Iran nuclear deal. 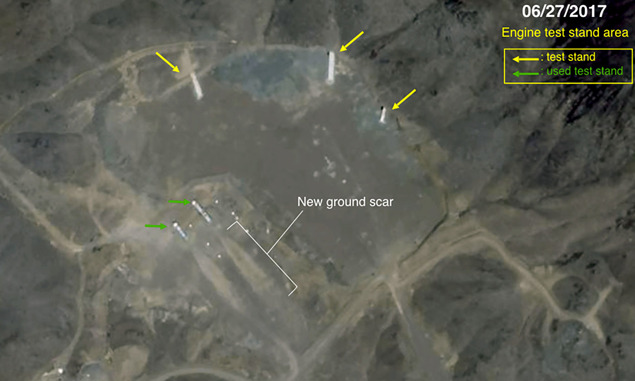 But an analysis of structures and ground markings at the facility strongly suggests, though does not prove, that it is developing the technology for long-range missiles, the researchers say. + from developing a nuclear weapon, or any other formal agreement. Still, if completed, it could threaten Europe and potentially the United States. And if Iran is found to be conducting long-range missile work, that would increase tensions between Tehran and the United States. Five outside experts who independently reviewed the findings agreed that there was compelling evidence that Iran is developing long-range missile technology. The researchers, based at the nonpartisan Middlebury Institute of International Studies at Monterey, California, came across the Iranian facility shortly after a young research fellow, Fabian Hinz, proposed studying a flurry of recent Iranian state media material on Moghaddam. He wanted to see if it contained clues as to how far Iran’s missile program had progressed before the general’s death. But offhand comments from Moghaddam’s colleagues and family members in the Iranian media seemed to imply that his work had quietly continued, the researchers say. That name caught Hinz’s attention. Shahrud, named for a town 40 kilometers away, was the site of a single missile test-launch in 2013. It had been considered dormant ever since and, when viewed by satellite, appeared disused. Was there more than met the eye? Poring over years of satellite imagery, the researchers noticed something: The number of buildings, they say, had slowly increased over time. They also spotted a detail that would stand out only to an obsessive follower of Moghaddam’s career: The buildings were painted a striking aquamarine. Moghaddam, known as eccentric and strong willed, had ordered his first facility, the one that was destroyed, painted that color. Now the same color appeared 300 miles away on a cluster of nondescript buildings in the desert. Many military technologies can be developed, at least in early stages, indoors. Ballistics labs, wind tunnels and enrichment facilities can be hidden in buildings or underground. Missiles are an exception. Their engines must be fitted into stands and test-fired — hazardous work that is typically done outdoors. And engine tests, when conducted in desert landscapes like those around Shahrud, can burn ground scars, shaped like candle flames, into the terrain. 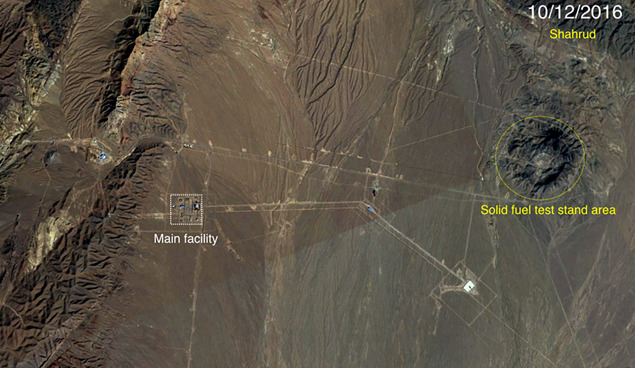 Ground markings left by rocket-engine tests at Iranian facility 25 miles from Shahrud, Iran. The researchers, piecing through satellite photos of the area around Shahrud, found, in a crater a few kilometers away, what they say were two telltale ground scars. They were larger than those at Moghaddam’s publicly known facility. The scars were recent. One appeared in 2016, the other in June 2017. The researchers scrutinized the test stands. Such structures typically weigh between four and six times the thrust of the engine being tested. And they are concrete, allowing their weight to be inferred from their dimensions. The researchers say Shahrud’s 2017 test used a stand estimated to be 370 tons, suggesting the engine powered between 62 and 93 tons of thrust — enough for an intercontinental ballistic missile. Two as-yet-unused test stands are even larger. There were other hints. Shahrud appears to house three pits of the sort used for casting or curing rocket components, the researchers say. One pit, at 5.5 meters in diameter, is far larger than those used for Iran’s medium-range missiles. The researchers confirmed that the facility remains active by using a new type of satellite imagery known as synthetic-aperture radar. By firing radio waves and measuring their echo, the satellite reveals greater detail than a photograph. Because of how it stores data, it can track minute changes between two sets of images, such as dirt kicked up by someone walking between buildings. And there appeared to be heavy vehicle traffic in and out of a tunnel leading underground, suggesting that Shahrud sits atop a large subterranean structure, the researchers say, though they could not say what it is for. The researchers were especially struck by the fuel — or, more precisely, they say, the fact that there was none to be seen. No storage tanks, fuel trucks or fueling stations. This underscored suspicions that Shahrud is building engines that burn solid fuel, they say. Solid fuel is far more difficult and dangerous to develop than the liquid kind. While it is also used in civilian programs like spaceflight, its military applications are considerable. Liquid-fueled missiles must be fueled right before launch, which requires time and access to special fueling facilities, making them easier for enemy forces to find and destroy. But solid-fueled missiles can be hidden in remote locations and fired at a moment’s notice. “We’ve stumbled onto this program that was much closer to being done than we’d realized,” said Jeffrey Lewis, who leads the California-based team that uncovered the facility. But closer to completing what, precisely? Perhaps only a more advanced version of Iran’s existing medium-range missiles. Still, this would not explain why the structures appear sized for larger missiles or why the work is conducted in such secrecy. Another explanation could be rockets designed to fire into space — though this is not necessarily benign. Countries will often develop space-launch rockets as a kind of test model for intercontinental ballistic missiles. North Korea and India both started their ICBM programs this way. Lewis estimated that Shahrud’s casting or curing pits could produce three rockets per year — not enough for an arsenal, but the right amount for a space-launch program. This could develop the technical know-how for an ICBM without one actually being built. A Revolutionary Guards officer named Majid Musavi, who is thought to be Moghaddam’s successor, seemed to suggest as much in his only known interview. A space program, Musavi said in 2014, allowed the scientists to continue their work while complying with orders from Iranian leaders not to produce missiles over 2,000 kilometers in range. Still, Shahrud’s focus on solid-fuel engines suggests that any space program there is intended for missile technology, said David Wright, a missile expert at the Union of Concerned Scientists. It is difficult to assess whether Iran would develop this technology as a precaution in case tensions spike with the United States, as leverage for future negotiations or as experimental testing for missiles that are still years away. Work at the facility is most likely intended as “a hedge” should the nuclear agreement collapse, said Dina Esfandiary, an Iran expert at the Center for Strategic and International Studies. The country does not appear to be sprinting toward a long-range missile, but preparing the ground in case Iranian leaders should one day deem that necessary. “It keeps the option open,” Esfandiary said. Lewis concluded that the program is holding deliberately short of a functional long-range missile. But if President Donald Trump succeeds in tearing up the agreement, or if Tehran feels threatened, Lewis warned, Shahrud suggests that Iran could acquire a long-range missile more quickly than has been previously known. “Like we did with North Korea, we are underestimating how capable they are,” he said, referring to North Korea’s surprisingly rapid development of an ICBM. With Trump’s exit from the nuclear agreement, hard-liners like Hajizadeh may be better positioned to push for resuming this work, Esfandiary said. “The situation has changed, because there’s no cap on their missile work and they have proof that the West doesn’t uphold its commitments,” she said.